In Skyscraper, to be honest, I thought Alice was a bit plain, but it would have been churlish in the extreme not to help her escape. Well, lucky I did because she appears to have had a makeover between the two games and, in the introductory cut-scene at least, is quite the smouldering temptress. And, even better – our hero has a date with her. Now, unfortunately, your character, Ron, is something of a bad-boy who by his own admission has little success with women. So when he turns up at Alice's flat having slept in an alleyway and smelling like a brewery, he gets short shrift from her. Thankfully, you saved her life yesterday – so you get one more chance. Your mission is to clean yourself up, deadbeat! There's a lot more to the story than this – it's an atmospheric, pleasingly noir-ish mystery involving supernatural forces that gradually unfolds across the two games, with the third game still to come. It's not essential to play Skyscraper first, but I would certainly recommend it to maximise your enjoyment of the story. In terms of game-play, the emphasis lies heavily upon problem solving by interacting with characters and objects. There's not much actual action, but plenty of trudging back and forth with different items! I don't mean this as a criticism, as I love this kind of game, but if you do get a bit stuck, it can quickly become tiresome. The game is reasonably close in style to Ceasefire (which had more action but suffered from very awkward object manipulation) and much earlier, Tir Na Nog and Dun Darach. Graphically, the game is superb, with colourful, attractive, flip-screen backdrops throughout the game. The central character, Ron, is well-drawn and animated, and in my opinion – if not Alice's – very much looks the part in a sweeping black trench coat. Other characters are static and of more variable quality, with some of the lowlifes in the slums looking a bit less convincing. 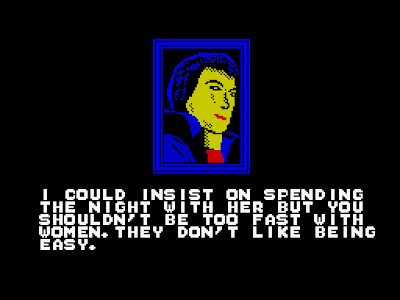 The story and significant interactions are relayed using 'comic strip' style cut scenes – which are of excellent quality of such that I do not remember seeing in another Spectrum game. There are also some really creative backdrops that give the game strong individuality. I loved the rooftop escape from the burning building in Skyscraper, and in Streets, the dockyard scene with the statue of Uriel, God of Flame, dramatically looming in the background. Although I have to say I wasn't so sure about the stereotyping evident in the Red Light District's 'Big Johnny' gay club, where all the clientele sport leather waistcoats and caps! 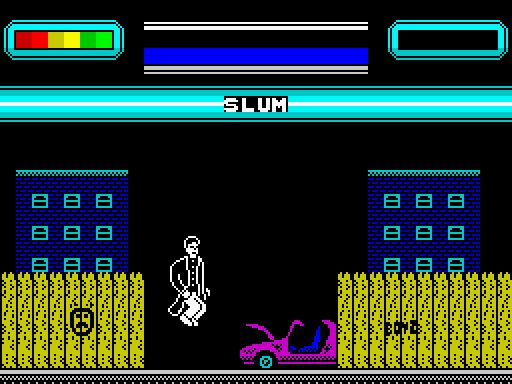 Use of sound in the game is absolutely minimal, with only the occasional bleep when actions are performed and the plod of Ron's footsteps to be heard. This is one area where the game could be improved, although the silence does help to create an eerie atmosphere for the story. Ron can carry two objects at once, and there are many more in the game, so it is soon necessary to choose a location as an object repository. Some objects are in plain view but most must be uncovered by searching scenery, speaking to characters, or solving problems. What I really like about the puzzles in this game is that some of them require Ron to be carrying two objects at once, which does add a level of sophistication that many graphic adventures lack. The solutions are logical and pitched at a sensible level of difficulty, being challenging enough to provide a sense of achievement when progress is made. Streets is clearly run on the same engine as Skyscraper, but a number of improvements are clear to see. The puzzles are better and there are no objects secreted in obscure places, frustrating the player. The graphics have improved, including the central character, and the occasional bugs evident in Skyscraper do not appear in the second game. One or two niggles remain – chiefly that in some instances you need to stand in exactly the right spot to perform an action, but the only way to tell where is trial and error. I would also like to see trudging back and forth minimised – perhaps by using shortcuts (hail a cab?) or being able to transport more items at once (using a backpack). It would also be positive if more use were made of multiple levels in the game, which would add some variety. Ron can jump very nicely, but it's rarely necessary to do so. Streets can be a little cruel; our poor hero can be killed at the drop of a hat – but in the days of emulation a regular snapshot can circumvent this issue. I really enjoyed this game: it is slickly presented and well designed, with an excellent storyline that holds the attention. If you like fast-paced games full of action, however, you need to look elsewhere. I look forward to the next instalment, where with any luck I will rescue (and no doubt win the heart of) the lovely Alice.